Newt Gingrich gave a remarkable and inspiring speech in Florida, challenging America to build a permanently manned research base on the moon by 2020, to go to Mars, to build a new propulsion system to get us to Mars and other planets in weeks instead of months, to encourage commercial manufacturing and tourism in space, and to award tax-free prizes to private companies to help get us there. An analysis of America's decline in leadership in space shows the lack of an enthusiastic champion has always been the single most important factor. The cost of the space program is essentially trivial--less than half of one percent of the budget for the entire NASA budget; which includes many bureaucratic expenses as well as many routine satellites and science programs. The moon/Mars rocket is already under development. Plans for lunar bases and Mars missions over the past five decades have identified the necessary elements, and with modern technology and manufacturing methods, as well as advanced materials, we can do it far cheaper and faster than we could have in past decades. All that lacks is someone to rally America to the challenge, to interest Congress in investing in it. The benefits to America of a bold space program are countless. Prime among them are high tech leadership and inventions, skilled jobs, investments in our economy, and not least, national pride. While Speaker Gingrich is to be highly commended for taking a powerful lead on the space program, the greatest mistake supporters of the space program can make is to rely only upon him--or any single person--to promote the space program. Gingrich may not be the nominee or the next president. Other candidates are already attacking his proposals as a way to attach Gingrich. Yet in so doing so, they are attacking America's greatest accomplishments. Attacks by other candidates and ridicule from the media on the could make the space program so 'radioactive' an issue that even Gingrich will be tempted to abandon it. Any candidate elected who has attacked these proposals may end up cutting the space program even further. Therefore, the most important task for space advocates and supporters is to urge all other candidates to equal or out-bid the Speaker on the issue. Contact the candidates and the President, and urge them to adopt similar or greater goals in space. 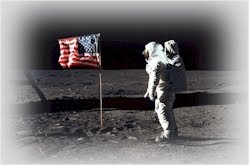 Contact the campaigns too and protest if candidates ridicule the space program or bold proposals like Gingrich's. You can call radio talk shows with this message, post comments on blogs and forums, write letters to the editor of newspapers, and post comments on news websites. Use these same techniques to protest news reports ridiculing the space program and its advocates. Further; call, email and write your members of Congress and candidates, and ask them to support a bold space program. These simple actions will help keep the space program not a partisan or single-candidate issue but the truly American issue it must always be; one strongly supported by all who stand for election this year. The propositions and ideas of Newt Gingrich about the moon, mars and outer space are great. It's just a matter of careful research and proper funding. With the advancement of technology, there are no impossibilities left. Please donate to help Save Manned Space lobby and conduct educational projects for a bold new space program to take us to the Moon and Mars! Donations are not tax deductible. Print Your Own "The Moon" Sign! The mission of the Coalition to Save Manned Space Exploration is to encourage Congress and President Trump to take action to adopt and fund a bold plan to build a Lunar base in the early 2020s and, and to land on Mars in the early 2030s. The Coalition was founded by Art Harman in 2010 as a completely non-partisan advocacy group following the cancellation of the Constellation program and specific plans for human deep space exploration; Coalition Director, Art Harman. Organizations, space experts, astronauts and individuals are invited to join the Coalition to help advance the cause. ●Call your Representative and Senators at 202-224-3121. ● Animators & Artists: Make videos/renderings. Space Analysts/Engineers: Advise & Write For Us. Scientists: Join the Distinguished Scientists Project. Organizations, Companies, Individuals: Join the Coalition. for More Actions You Can Take. to Go to the Moon? Copyright © 2017 Art Harman, Save Manned Space -*-. Awesome Inc. theme. Powered by Blogger.